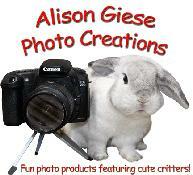 Welcome to Alison Giese Photo Creations! The photo greeting cards on the following pages feature funny bunnies and cute pooches who wish to entertain you. Please take a few moments to check out the many cards and other items available for purchase from this site. To place an order, please see the How to Order page. If you have any questions, please email PhotoCreations@AlisonGiese.com. Click on the images below to see larger views. To place an order or to learn more about Alison Giese Photo Creations greeting cards, please go to the last page on this site, "How to Order." Alison Giese started her line of photo greeting cards after being inspired by the diverse and delightful personalities of her adorable companion animals. All of the bunnies and dogs featured in these cards were adopted from shelters or rescue organizations. Alison and her husband George are currently owned by two dogs and ten rabbits, all living peacefully together inside their San Diego home. 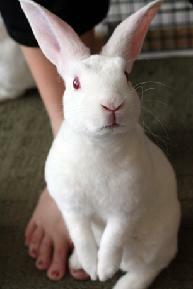 Alison admits to having a "rabbit habit," largely due her volunteer work for the San Diego House Rabbit Society (SDHRS). 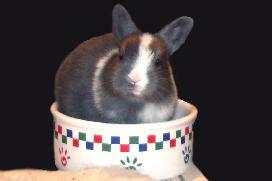 She is a foster home and does the layout, design and editing for the SDHRS's quarterly newsletter, "The Rabbit Reader." Among other things, she is the photographer for the SDHRS events and also photographs many of the adoptable foster and shelter rabbits for adoption websites and various publications. 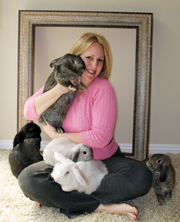 She designs the SDHRS advertisements, flyers, postcards and other printed materials to assist in finding permanent homes for abandoned rabbits and helping to educate the public about these often misunderstood companion animals. 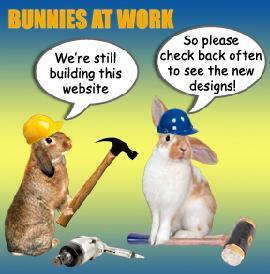 Alison also updates the www.catsandrabbitsandmore.com website featuring adoptable rabbits in San Diego county. Please adopt your next pet from your local humane society, shelter or rescue organization. There are so many wonderful homeless animals out there eagerly awaiting a loving home! Boo is mystified by all these silly bunnies! She is an angel who can do no wrong. Bebe is obsessed with food and loves Buddy almost as much as her dinner. Buddy is a no-nonsense guy who takes good care of his best friend, Bebe. Bernie has no clue he is a rabbit. He is extra friendly and seems to think he is a dog. Shy Baxter is as sweet and fluffy as cotton candy. Scooter is his best friend. Scooter is the most adorable bunny ever and uses fluffy Baxter as his pillow. "Princess" Lucy gets whatever she wants with those big brown eyes. Ruby's energy and enthusiasm is endless. She loves and protects the bunnies. Isabella is beauty, grace and poise. But she can be silly sometimes, too! There's never a dull moment with Ozzy! He's a sweet, big boy with energy to spare. Calli is a tiny girl who started off shy and skittish, but is now sweet, confident and happy. Cute little Oliver is sometimes called "propeller head" because he has one ear up and one ear down. Sweet Madison is the most beautiful, unique bunny. She is a crazy mix of Dutch, Angora and Lop! Domino is a happy, silly and extra friendly guy! He has a crooked little mouth so his tongue sticks out. Guest star Macy & her siblings (following) were adorable babies I fostered until they were old enough to be adopted out. I fostered a litter of five baby bunnies for a local shelter from the time they were 5 days old until they were adopted out to their "forever" homes. To see photos (just for fun) of the foster babies as they were growing up, click here.